The Chrysler 300G was the last three hundred to wear Virgil Exner's fins. Major differences from the previous year's model included a new front end with canted quad headlamps and a new rear treatment, without the fake continental spare of the prior years 300F. The taillights were relocated from the fins to above the rear bumper. Both engines used ram induction with the high performance engine using shorter length induction tubes. 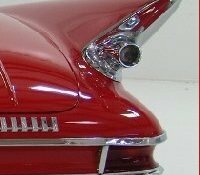 Other changes included reshaping the canted tail fins and replacing the (optional) Imperial-like trunk lid with a ribbed unit. Interior revisions included a speedometer that read from 0-150 mph in single mph units, a black finish for all painted sections of the dash, and changes in the design of the dash panel padding and seat perforation. Among the 300 G's equipment features were chrome wheelcovers, a "SilentFlite" fan drive, front and rear armrests, windshield washers and an electronic clock. Numerous options were available including air conditioning, remote-control exterior mirrors, six-way power seat, power door locks, and a "Sure-Grip" differential. 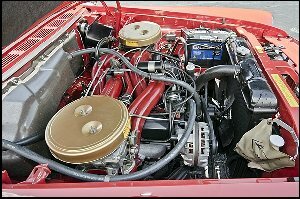 Under the hood, the two Wedge V8s with "long" and "short" ram tubes carried over, but a standard axle ratio of 3.23:1 gave the 300 G a slight top speed advantage over the 300 F. On the optional 400 bhp version, a Chrysler heavy-duty three speed manual transmission replaced the expensive French four speed. Other performance highlights included suspension front torsion bars that were 33% stiffer than standard, 60 inch leaf springs that were 9% stiffer than standard, and 8.00x15 Goodyear Blue Streak Super Sport high performance white wall tires. 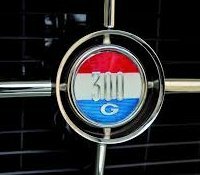 300G SERIES - (8-CYL) - The 30OG was still considered a part of the high-performance market by those who appreciated brute horsepower in a luxury automobile. 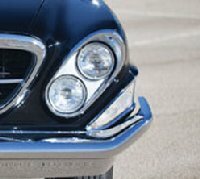 Its styling mirrored the minor styling changes found in the other 1961 Chryslers. 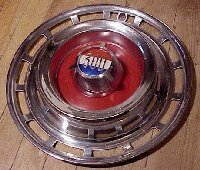 The grille insert was 300 through and through and the lower rear quarter panel molding and red-white-blue medallion continued for the fifth continuous model year. Ram manifolding (long type) continued as standard fare. A few cars were built with three speed standard shift. Some cars were built with the short-ram, high-output engine. 300G SERIES I.D. NUMBERS: Serial numbers and motor numbers were located in the same positions as on previous series. Serial numbers on the Detroit built cars began with 8413-100001 and up. V-8. Cast iron block. Overhead valves. Displacement: 413 cubic inches. Bore and stroke: 4.188 x 3.75 inches. Brake horsepower: 375 at 5000 R.P.M. (400 at 5200 R.P.M. optional). Compression ratio: 10.1: 1. Five main bearings. Hydraulic valve lifters. (Solid valve lifters on optional V-8). Carburetors: Two (2) Carter four-barrel Type AFB Model 2903S. CHASSIS FEATURES: Wheelbase: (Newport and Windsor) 122 inches; (New Yorker and 300G) 126 inches. Overall length: (Newport and Windsor) 215 inches; (Newport wagon) 216.1 inches; (New Yorker and 300G) 219.8 inches; (New Yorker wagon) 220.1 inches. Tires: (Newport and Windsor) 8.00 x 14; (Newport wagon) 8.50 x 14; (New Yorker) 8.50 x 14; (New Yorker wagon) 9.00 x 14; (300G) 8.00 x 15. CONVENIENCE OPTIONS: Power steering on Newport and Windsor ($108). Torqueflite in Newport and Windsor ($227). Power brakes in Newport and Windsor ($44). Power windows, except standard in 30OG ($108). Power seat ($102). Swivel seat in Newport convertible and New Yorkers except station wagons ($87). Heater ($102). Air-conditioner, all except station wagons ($510) Air-conditioner, in station wagons ($714). Golden Tone radio ($100). Golden Touch Tuner radio ($124). Power antenna ($26). Auto-Pilot, except in 30OG ($86) Flitesweep deck lid, except station wagons and 30OG ($43).Rear window defogger ($21). Sure grip differential ($52). Left hand outside remote mirror, in all except New Yorker ($18). Tinted glass ($43). Undercoating, standard on 30OG ($18). Dual exhausts, New Yorkers except station wagons ($27). Closed crankcase vent system ($5).